A strong friendship emerged between the two, and our founder was inspired not only by the man's many great life stories but also by his class and timeless style of fashion. Daniel Wellington loved to wear his watches on old NATO straps. The style was eventually captured into the brand of watches. 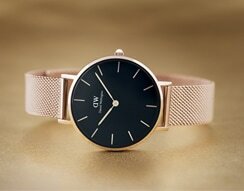 The Daniel Wellington watch is, without any doubt, suitable for every occasion. Regardless if you are attending a black tie event, playing a game of tennis or enjoying a sunny day at the beach club – the Daniel Wellington is a beautiful companion. Watch faces are specially designed and developed so that they go perfectly with the thin NATO and leather straps you can order them with. Straps are interchangeable, allowing you to have a different watch for every day of the week. A strong social movement started since the launch and has been increasing since. Join the #DanielWellington social media movement by following @DanielWellingtonWatches on Instagram. Founded by Filip Tysander in 2012 and headquartered in Stockholm - Sweden, Daniel Wellington watch brand is currently being distributed in approximately 25-30 countries.